After flashing the device and attaching standard power to it, the device should start broadcasting a wifi SSID. 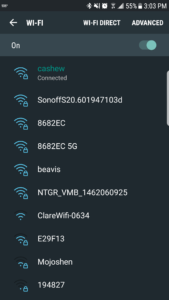 The SSID will match the device type followed by a period and then some characters representing the devices MAC address. For example, the Sonoff TH would look like SonoffTH.3d8883d0f90f and the SmartLife H801 would look like esprgbw.5d7d404fe294. 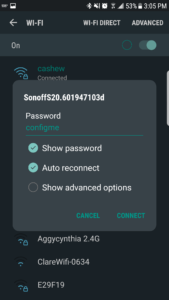 You then connect to the AP with the password: configme.